Great news! 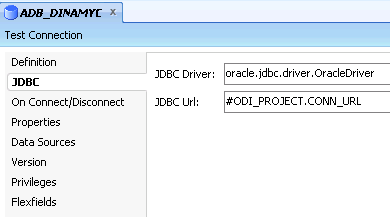 Oracle just released “Patch 21156142: Parametric connections in ODI 12c don’t work anymore” which enables this technic to be used in ODI 12.1.3! Thanks Marius for this great tip!!!! Unfortunately, this technic only works on ODI 11 version. 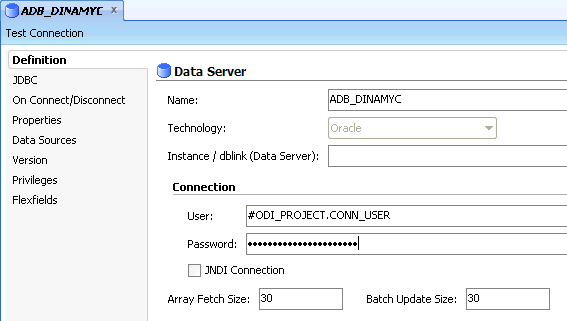 ODI 12c does not support dynamic password settings. We will let you know if we figure out a workaround for it. Hi all, how are you doing? I came across this interesting situation during a project some time ago. Imagine the following scenario: You have a transactional system that was implemented in several places around the word. The system and its tables are exactly the same, but they are distributed across different databases, with different user names, database schemas, passwords, etc. Your task is to load data from this system with all these different database regions into your data warehouse, unifying all this data into one single place. Since all the tables have the same structures, how can you accomplish that with ODI without creating a lot of duplicate interfaces? In resume, you create one interface object loading a table from the source system into your data warehouse and each context that you have created will point to a different database. It is just a matter to run that interface for each context and that’s it. However, there are situations where we cannot create that many contexts in a real production environment. In my case I couldn’t create those contexts because production execution repository is used for several other projects where those new contexts would just not make any sense at all. In production, the users have just one context called “Production” and they run any ODI job using that context, independently of the project which that ODI scenario belongs to. We could explain and teach the users to use multiple contexts, but my experience as a developer taught me that we need to let things as simple as possible to the end users, because there will be a day (for sure) that someone will execute a job using a wrong context and a mess may be created. As you can see, we have added five ODI variables in the topology information. 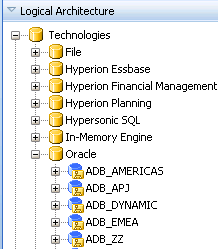 These variables will be used to receive all the dynamic information from the different databases that we need to load. Now create one logical for each physical schema that you have created and point them accordingly in your context. Notice that we are also creating a logical schema called ADB_DYNAMIC that is going to point to our dynamic physical schema. Now this is an important step. 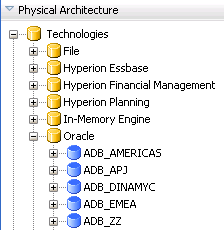 Your models in ODI need to be pointing to ADB_DYNAMIC logical schema to make this work, but if you did not develop your interfaces yet and you also need to reverse your models and so on, you will not be able to do it pointing to this dynamic topology, since it has just ODI variables and not actual values there. 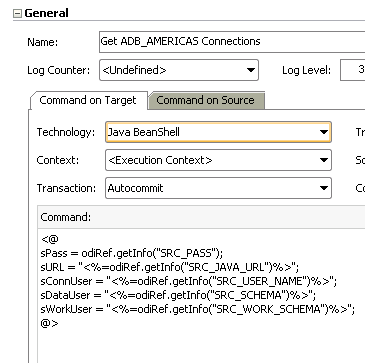 So you will need to point your ADB_DYNAMIC logical schema temporally to a “normal” physical schema, let’s say ADB_AMERICAS to develop your interfaces. If you do this way, you will be able to reverse your models using ADB_DYNAMIC logical schema and you will be able to test all your interfaces pointing to one “valid” database without any additional work. 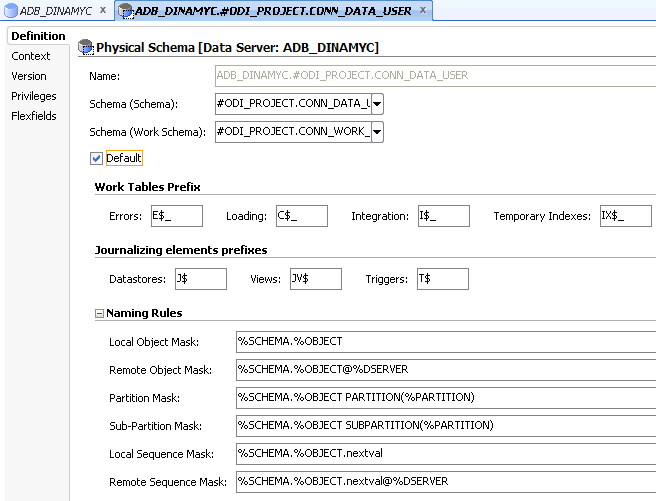 After you complete your entire development, just point ADB_DYNAMIC logical schema back to ADB_DYNAMIC physical schema and proceed to the following step. This step will call the child scenario passing as parameters all the connection information that is needed to be used in ADB_DYNAMIC connection. 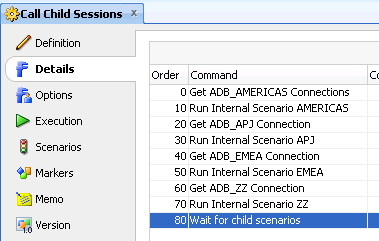 When this child scenario runs, all interfaces inside of it will use ADB_AMERICAS connection information and will load data from it dynamically. Cool isn’t it? You are going to do the same configuration for the other steps in this procedure and the only thing that is going to change is the logical schema that you need to point in the “Command on Source” table. So “Get ADB_APJ Connections” will get ADB_APJ connection information and so on. So here is the end of this post. I hope you all enjoy!